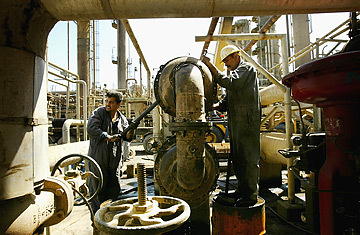 Employees work at the Adora Oil Refinery in Baghdad, Iraq, in March 2004. In his speech announcing plans to boost troop levels in Iraq, George Bush noted that Iraq was about to pass "legislation to share oil revenues among all Iraqis" in order to give the citizens of that country a share in the economy. Indeed, the 33-page draft of that proposed Oil & Gas Law now circulating, if passed as currently written, would end decades of total government control over Iraq's mammoth oil reserves and distribute oil income among all the country's regions  a dramatic change from the past and a potential windfall for Big Oil. But it must first get through Iraq's fractious parliament and the country's divisive ethnic politics. Already, the draft shows signs of wrangling and potentially troublesome compromise. With the stakes high, negotiations have been fraught, particularly with the Kurds in the country's oil-rich north. A small government committee met in Baghdad over several weeks late last year to thrash out whether the Kurds' regional government could cut its own oil deals with foreign companies without Baghdad interfering. Kurdish officials have argued their case for months. The proposed law offers a tortuous compromise. A new Federal Council of Oil & Gas will have 60 days to object to any oil deal the Kurds make, and only then with the agreement of two-thirds of the council's members  which will include a Kurdish official. Disputes would also be taken to a new group of independent advisers, who "might include foreign oil and gas experts, Iraqi or foreign," says the document. Equally thorny is the status of the giant oil fields around Kirkuk, whose capacity is about 700,000 barrels a day, and which the Kurds claim as their own. Under the new law those revenues  like those from elsewhere  will flow into a new national Oil Fund and then be carved up among each region in proportion to its population. Since only the Kurds in the north and the Shi'ites in the south produce oil, that ensures Sunni areas around central Iraq  coyly termed "non-producing provinces" in the law  aren't left out of the deal, potentially deepening Iraq's ethnic divide. As written, the law would end more than three decades of Iraq's nationalized oil industry. It would give 10-year exploration and development rights to foreign oil companies  at least those willing to start drilling in a country where hundreds of contractors have been killed and pipelines are regularly blow up. Once the exploration deals expire, the companies can negotiate to produce the oil for another 20 years in partnership with the state-owned Iraq National Oil Company. Foreign oil companies would then pay the government 12.5% royalties of the oil's value, and be able to export the rest of whatever oil they find  potentially massive amounts. Indeed, early word of the document last weekend brought howls from some groups that believe Iraq's government is offering big oil companies overly generous production-sharing deals, which it could regret when the war finally ends. The alternative would be heavy state control, along the lines of the two oil giants that border Iraq, Saudi Arabia and Iran. "What we are looking at is Iraq signing deals for next 20 years at a time when it is extremely weak and not fully sovereign," says Greg Muttitt, co-director of Platform, a watchdog organization in London that monitors the oil and gas industries. "The U.S. has put a lot of effort into this." But it's not certain that U.S. or British majors like ExxonMobil or BP will be the first big benefactors. Both China and India signed exploration deals with Saddam before the war, which remain in effect. Whichever companies arrive, their finds could be massive. The country sits atop about 115 billion barrels of oil reserves  the fourth largest in the world after Saudi Arabia, Canada and Iran  and about 110 trillion cubic feet of natural gas. What is more, much of the oil is relatively easy to reach and cheap to pipe out. There is a catch, however: the infrastructure is in dire shape. Even before this war, rigs and wells had lain rotting for years, since the crippling war with Iran in the 1980s sapped the economy and international sanctions in the 1990s left Iraq in bad need of spare parts. "The consequences have been really quite severe. Things are in bad shape," says James Placke, senior associate of Cambridge Energy Research Associates, who spent decades in the region as a U.S. diplomat. "It is not a good investment environment." That is an understatement. Iraq's oil minister Hussein al-Shahrastani has said in recent months that it will take about $20 billion to fix Iraq's equipment well enough to more than double its current output of about 2 million barrels a day, to about 4.5 million barrels in five years' time. In Iraq, that is a very long time off.